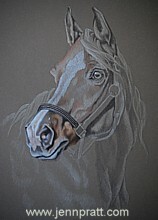 Freckles – Underpainting in Coloured Pencil | Jennifer Pratt Equine Artist. I have begun the under-painting of Freckles in coloured pencil. I have lightly mapped out the lower layers in lights and darks over the entire work. I have moved into more detail on the muzzle. I will continue to work back and forth between working on detailed sections and under layers. The detailed sections require more intense concentration and patience, so working back and forth in this manner helps to keep me fresh. Wonderful job Jennifer, you must have to work from very good photos to capture the amount of detail that you want in the finished portraits. So you start with an under painting done in colored pencil then what medium to you use over that -pastels? thank you, I am using coloured pencil exclusively for this. Good photos are important, I also make it a point whenever possible to personally visit each horse. Of course, long-distance horses are difficult, but then I try and get video, so I can get a 3-D image of what I am working with. Also, detail, close-up shots of special markings etc..